Last night was the press launch of this years Underbelly Fringe Festival, and I was lucky enough to see a glimpse of what’s on offer. 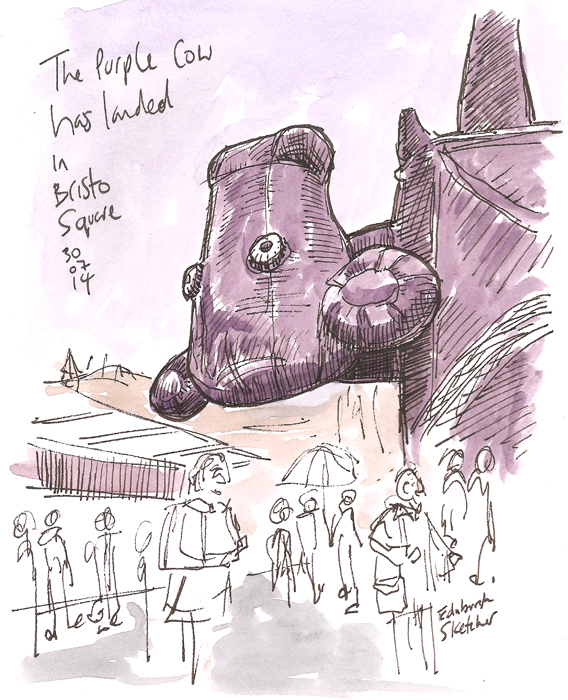 It was great to be back under the gaze of the upturned coo, and as the transformed and unrecognisable Bristo Square filled with those eager to see what this years Fringe Festival had in store I sketched the inflatable heed :). Compare for the evening was the very funny Felicity Ward, who did a great job introducing each act, and dealing with a rowdy crowd and kept the evening flowing superbly. Each of nine acts (ten if you include Felicity) had around five minutes to show off their act in a bid to make it into the watching reviewers ‘highlight of the night’. 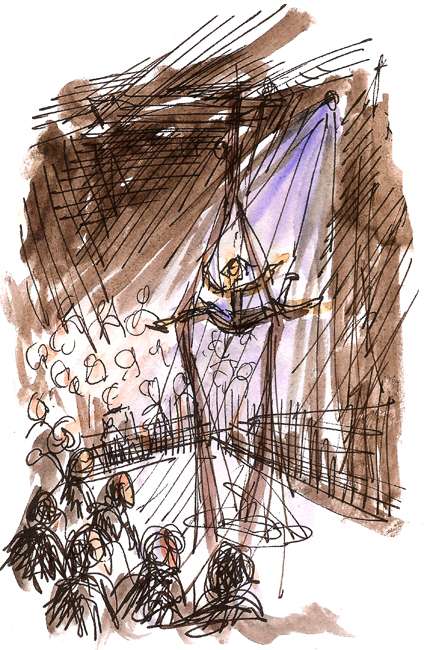 For me that honour went to the spell binding ‘Circa: Beyond’, an amazing show of strength and agility which saw a performer suspend from a piece of material, high from the stage. A close second though was a hilarious double act called ‘Frisky and Mannish’ who sang out letters of advice for pop stars, possibly (or possibly not!) penned by Sinead O’Connor. 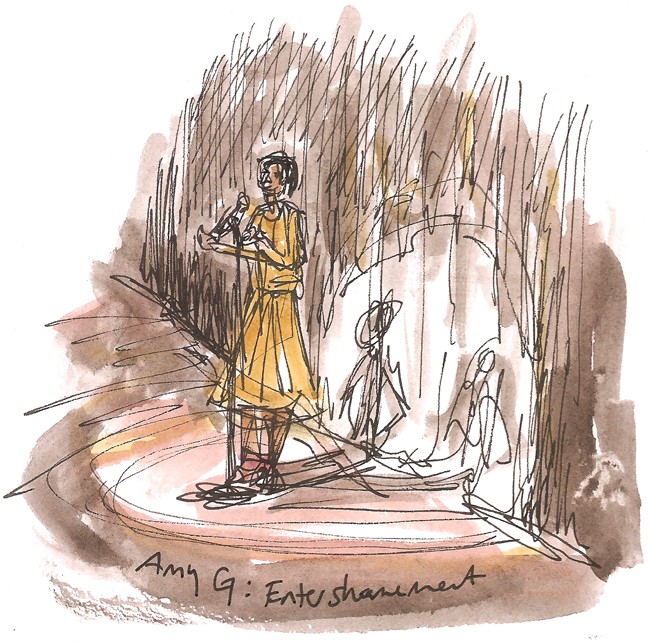 All the acts entertained and I can’t wait to see more, one thing is for sure – the Edinburgh Fringe has definitely begun! 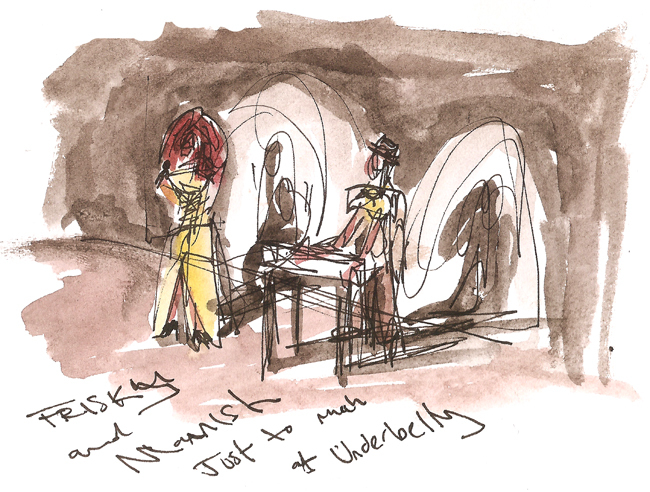 Below are a few of my sketches from the night, scribbled largely in a darkened theatre!! For more information about the acts on at the Underbelly this year see their website below.